Steel comprises iron and other elements such as carbon, manganese, phosphorus, sulfur, nickel, chromium and more. Variations in steel compositions are responsible for a great variety of steel grades and steel properties. Iron is the basic component of steel. When carbon, a nonmetal, is added to iron in amounts up to 2.1%, the result is an alloy known as steel. Each element that is added to the basic steel composition has some effect on the properties of the steel and how that steel reacts to fabrication processes. These additions and variations in steel compositions are responsible for a great variety of steel grades and steel properties. For example, proper steel composition provides enhanced strength and /or toughness and an opportunity to use cost-effective and straightforward heat-treatment methods. Besides alloying elements, steel composition almost always includes small amounts of impurities which are present in steelmaking raw materials such as scrap or hot metal. Generally, the impurity content is kept so low that its presence is not detrimental to the properties of the steel. Finding a material from the database of over 350 000 alloys takes mere seconds. For example, let’s look for a low alloy Japanese steel with the following chemical composition of: C 0.15 – 0.26; Si < 0.35; Mn < 1.5; P < 0.035; S < 0.040; Mo 0.4 – 0.6. Click Advanced Search from the main window. 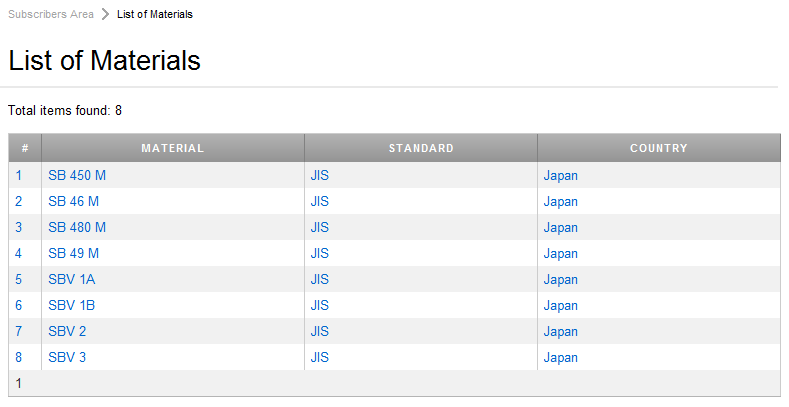 Next, select Japan/JIS in the Country/Standard field. 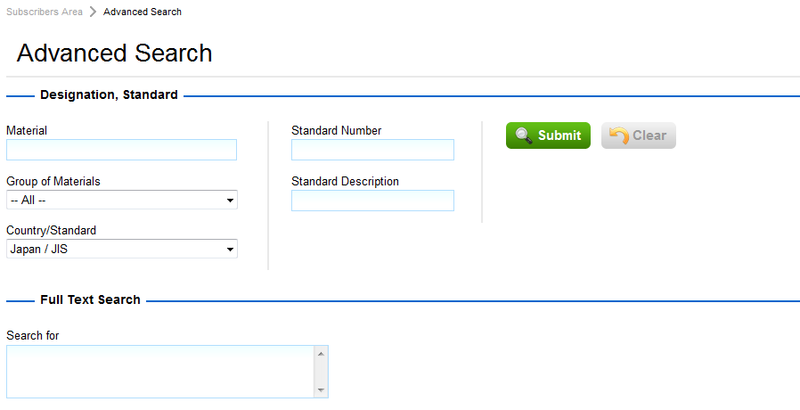 Within the Chemical Composition group, check the known parameters, enter values and click the right arrow icon. The search results screen appears. 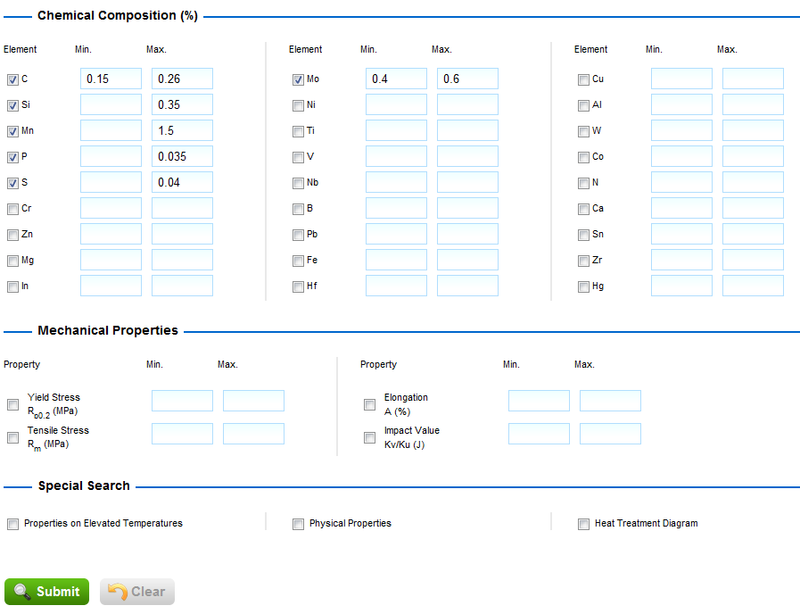 You can simply click on a material to review its detailed properties.